Hey, We didn't even need to make a hole through the firewall. The sad thing is I see this way to often. Some data guys just have no clue. Some of you may not recognize what that hole is. 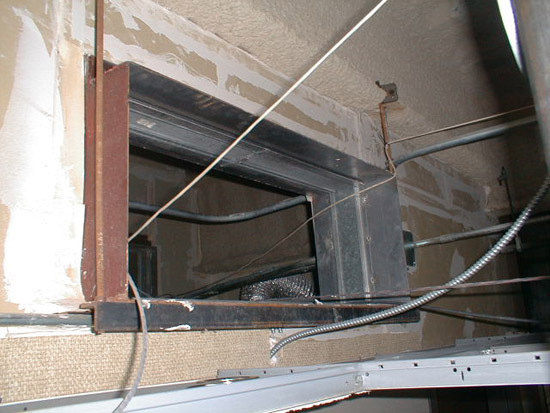 That hole lets HVAC air pass through a fire wall, however the metal duct is a fire damper. It is held up by pieces of easily melted metal, during a fire it is supposed to drop down and seal off the hole. It only drops by gravity and the wires passing through will hold it open. This may seem minor but it is not, smoke is the biggest killer in a fire, this damper was put in for a definite purpose. IMO running wires through that hole is no different then disabling sprinklers or smoke detectors, it could very well cause death. Iwire hit the nail on the head. This building is a three story building around 112,000 square feet. All of the ceiling tiles had been removed as the entire building went out for bid for a new tenant. I brought my camera and shot 60 code violations. I could have taken hundreds more. The good news is that part of the bid is to get the building back into compliance. This is where I bring out my handy wire cutters...SNIP, SNIP, SNIP, SNIP. Expression on data guy's face: PRICELESS! I agree with your comments on this one. With an open damper in the ceiling, you might as well leave all the doors open in the rooms below as well. The movement of super-heated air currents in a burning building, is a Fire Brigade's worst enemy, it just helps the fire spread. The data guy probably thought it was an abandoned air ductwork. Maybe signs describing its purpose and a warning not to pass wires and such thru it posted next to it would help. I'm surprised nobody has noticed the unsealed penetration around the electrician's unstrapped flex. The data/comm guys aren't the only culprits here. Greetings, I am new to this forum,but have been viewing it for some time. I work in IT BUT I also posess the MN Power Limited Technician low voltage license. Just to let you know I would'nt run any cable in this manner either,and would probably take a pair of cutters to it myself. It's situations like this that prompted Minnesota(where I live) to mandate licensing for low voltage installers. I do a variety of things in IT for my employer,from desktop admin to planning,layout,installation and repair of voice,data, and fiber cables. I like this website,and enjoy looking at the violation pics. Whenever I feel I'm not doing that great a job installing things,I look at some of these pics and feel rather re-assured..
Just a follow up-I agree some datacomm people don't have a clue, and many in IT are highly specialized in one small area. Years ago, I worked with a co-worker on a project where I had to construct some special RS-232 adapters that needed resistors between some of the pins,I told her this and her reply was "what's a resistor?" I explained and she said"what's an ohm?" CLUELESS!! She could configure routers etc(so can I). These people should'nt go near any wiring projects.